> I think I’m just going to stop piling up the false statements, such as “I’m back for the summer! I’ll post more consistently now!” because evidently I’m unable to live up to any of them. I’m making no promises from here on out. I don’t know when the next time I’ll write an article after this: it could be tomorrow, it could be months from now. And I could go on making excuses about why I haven’t been writing recently (and there are some valid ones), but I’ll admit part of it is because this team has been horrifying to watch for the most part. > I can’t say I’ve missed writing about this team. I’ve missed writing in general, but writing about this 2013 Brewers team throughout the first half would have certainly been frustrated rants every other day (perhaps even more often than that) and me repeatedly saying that I’ve given up hope on them. That doesn’t mean I’ve stopped watching the Brewers- I need my fill of baseball, after all, and this is the only team I can legitimately root for. I couldn’t change loyalties if I tried. However, when I say I’ve given up on them, I mean it. And if you haven’t given up on this 38-56 crap show, I’d call you insane. What exactly has led to this 38-56 first half? There are plenty of contributors. When Juan Francisco, Yuniesky Betancourt, and Sean Halton- among others- are constantly in the everyday lineup, you know it’s bad. The starting rotation has been possibly the most inconsistent in the Majors. The star player is going to be suspended any minute now (though that won’t matter; not like he’s been in the lineup consistently for two months already). And, to top it all off, the manager is still a bonehead. In the game before the All-Star break, the Brewers defeated the Diamondbacks, 5-1. How? Beats me. Logan Schafer (hitting .234), Francisco (.252), Martin Maldonado (.180), Betancourt (.198), and Jeff Bianchi (.236) were all in the starting lineup. The win was in large part because of another solid start from the resurgent Wily Peralta (who I’ll talk more about later), but the lineups our manager has been putting out there are comical. It’s only a matter of time before MLB suspends Ryan Braun- and hundreds of others across professional baseball- for not cooperating with their Biogenesis case. On the bright side, it sounds like Braun’s suspension will be for only 50 games instead of the originally suspected 100, because there’s still no proof that he actually used performance-enhancing drugs (though any non-Brewers fan will likely tell you otherwise). It’s been a lost season for Braun without all that nonsense surrounding him, however. Following his long stint on the DL, he almost immediately went on the bereavement list. He’s back in the lineup tonight against the Marlins, but don’t expect him to be there for long. Originally, I wasn’t going to blame this season on Ron Roenicke, because a lot of things haven’t gone his way. It’s hard to fight through so many injuries to both the rotation and the lineup. But when he never puts the best possible team on the field that he can, it’s hard not to blame him. I can’t remember the last time Braun, Aramis Ramirez, Carlos Gomez, Jean Segura, Jonathan Lucroy, and Norichika Aoki were in the lineup at the same time. Braun and Ramirez have had their share of injuries, but the other four have been perfectly healthy, yet Roenicke almost never plays all four on the same day (at least that’s how it feels). Yet he insists his team hasn’t given up. Maybe the team hasn’t, but he most certainly has. > Now that I’ve gotten through most of the negatives, let’s move onto the positives, because there are some, believe it or not. Segura and Gomez are both having breakout campaigns as we speak, and both were rewarded with trips to the All-Star game in New York. Neither of them had hits- they were fortunate/unfortunate (depending on how you look at it) enough to face Mariano Rivera in his final All-Star appearance. But Segura turned a slick double play, which even drew praise from notorious anti-Brewer commentator Tim McCarver. Gomez was put in right field, a position he’s somewhat unfamiliar with, and that was exposed when he dove and missed a ball that wound up letting Prince Fielder have a triple. As mentioned earlier, the starting pitching has been nothing to write home about, but the recent pitching of Peralta has been encouraging. He’s managed to hold down some tough contending teams, such as the Braves, Reds, Nationals, and Diamondbacks. In fact, he threw the first complete game for the Brewers since their first win of 2011, a three-hit shutout against the Reds. Needless to say that is my highlight of this season regardless of what happens from here on out. Lastly, the bullpen has been one of the best in baseball, and I’m not even joking. After 2012’s disastrous “blowpen,” the retooled bullpen has been very solid. John Axford is regaining his form after a terrible start to his season. Francisco Rodriguez latched back onto the Brewers with a minor league deal and put his ineffective 2012 season behind him and has turned himself into nice trade bait. Jim Henderson has been shaky since returning from the DL, but his stats also make him look like a nice trade piece. Lefties Michael Gonzalez and Tom Gorzelanny (who has also been used as a starter a bit) also could be moved. > Other than the bullpen pieces just mentioned, there are a few more names who could be moved before July 31st’s trade deadline. Gallardo’s name has been tossed around simply because he has another year of team control after this, not because he’s been particularly effective on the season. The Diamondbacks reportedly had interest in him, but they weren’t interested in moving pitching prospect Tyler Skaggs, who probably would have had to have been included to make a deal happen. MLB Trade Rumors reported that the Yankees and Red Sox will have scouts watching Ramirez next week when he comes off the DL. There could be some interesting prospects to acquire from either of those teams, especially the Sox. > And that’s all I’ve got right now. The Brewers are playing as I write, so maybe a recap will come later tonight. > For the second straight offseason, the Angels have picked up the best hitter on the market with a sneaky deal that no one saw coming. Following a year in which they gave Albert Pujols a 10-year, $254 million deal, they handed out another huge contract to Josh Hamilton, this one for five years and $175 million. If you told me you saw this coming, I’d call you a liar. Their outfield seemed set with Mike Trout, Mark Trumbo, and Peter Bourjos, a young core that could last them a long time. But, much to the chagrin of their division rival Rangers, they went out and stole the best free agent on the market, and will insert Hamilton into one of those outfield slots (likely Bourjos’). It was speculated all offseason that the Brewers had interest in Hamilton, and there were articles as recent as December 6th saying that Milwaukee would make a run at him. But, realistically, the Brewers were never going to get him, especially at his price tag. Anyway, the Angels’ lineup now looks something like this: Trout, Erick Aybar, Pujols, Hamilton, Kendrys Morales, Trumbo, Howie Kendrick, Alberto Callaspo, and Chris Iannetta. Looks like Los Angeles is the new New York. > The Brewers’ top starting starting pitching target, Ryan Dempster, was also taken away, as the Red Sox wooed him with a two-year, $26.5 million deal. Apparently, the Brewers were willing to give Dempster two years plus an option for a third, but they didn’t come close to what Boston was offering cash-wise. Anyway, I don’t see Dempster doing well in the American League after what he did for the Rangers last year, but that was his choice. With Dempster off the market, the likelihood of the Brewers bringing in a free agent starter this offseason decreased by a lot. The rest of the crop is either too Jeff Suppan-like or won’t fit the Brewers financial situation. The next best option after Dempster would be Edwin Jackson, but that would only happen if he would be willing to take a one-year or two-year deal. If the reports of Jackson wanting a four or five-year deal are true, then the odds of him coming to Milwaukee aren’t very good. 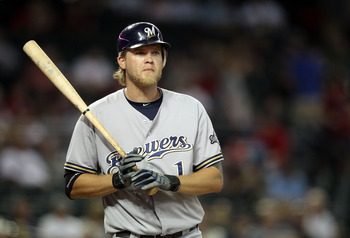 But, as I’ve been saying, it isn’t the end of the world if the Brewers don’t bring in a new starter for 2013. I’m completely fine with them staying in-house and using the prospects who are big league-ready. If that is the case, the ideal rotation for the Brewers would be Yovani Gallardo, Marco Estrada, Chris Narveson, Wily Peralta, and Mike Fiers. While that seems like a relatively inexperienced rotation to someone who doesn’t watch the Brewers everyday, I think the Brewers will get by, especially with the best offensive lineup in the National League backing them up. > One more major signing: the Tigers finalized a deal with Anibal Sanchez, who nearly went to the Cubs, this morning. The Cubs reportedly had a five-year, $75 million deal in place with Sanchez as recent as last night, but the Tigers were given the opportunity to counter the offer, and wound up getting him back. Sanchez was one of the starters who the Brewers probably wouldn’t have been able to afford, but at least it’s good that the division rival Cubs won’t get him. > Doug Melvin basically said that he doesn’t want Shaun Marcum back. > The Brewers have been linked to Mike Adams, one of the better relievers on the market, recently. But Tom Haudricourt considers them out of the hunt for him. Adams started his career with the Brewers, pitching for them from 2004 to 2006. > Long-time Brewers farmhand Amaury Rivas has signed a minor league deal with the Marlins. He was always one of my favorite minor league pitchers for the Brewers, but I figured he’d be gone at some point. Rangers: Signed Brandon Snyder to a minor league deal; outrighted Konrad Schmidt to Triple-A. Padres: Signed Juan Oramas, Sean O’Sullivan, Gregorio Petit, and Rene Rivera to minor league deals; acquired Chris Rearick from the Rays. Twins: Signed ex-Brewer Brandon Boggs, Ray Olmedo, Bryan Augenstein, Reynaldo Rodriguez, Scott Earlton, Virgil Vasquez, Mike O’Connor, and Jason Lane to minor league deals. Giants: Signed Andres Torres to a one-year deal; signed Chad Gaudin to a minor league deal. Braves: Signed Ramiro Pena to a one-year deal. Rockies: Signed Tommy Manzella to a minor league deal. Mets: Re-signed Manny Acosta to a one-year deal. Yankees: Signed Bobby Wilson and Gil Velasquez to minor league deals; designated Josh Spence for assignment. Cardinals: Signed Alex Reyes to a minor league deal; signed Ty Wigginton to a two-year deal. Nationals: Signed Neivy Pilier and Brian Bocock to minor league deals. Rays: Acquired Vince Belnome from the Padres. Phillies: Signed Andres Blanco, Josh Fields, Cesar Jimenez, Steven Lerud, Michael Martinez, Zach Miner, Jermaine Mitchell, Pete Orr, and Humberto Quintero to minor league deals; claimed Mauricio Robles off waivers from the Mariners. Royals: Signed Xavier Nady to a minor league deal. > For the first time this offseason, Shaun Marcum has said that he would be open to re-signing with the Brewers. Perhaps this is because the other teams that have expressed interest in him include the Twins, Royals, Padres, and Cubs. Unlike some other fans who have unfairly hated on Marcum just because of his bad postseason run in 2011, I wouldn’t mind seeing him back on something like a two-year deal. But I’ve just gotten the impression that, ever since around January of 2012, Marcum and the Brewers’ front office have a bad relationship. The reason I say that is because Marcum appeared to be complaining that the Brewers hadn’t offered him a contract extension yet (which they still haven’t, nor have they given him a known offer this offseason). There’s always the injury factor with Marcum, something that was exposed this year when he missed two months because of an elbow issue (he was originally only supposed to miss one start). But, looking at the numbers, he’s been nothing but a solid pitcher since coming to Milwaukee- he’s 20-11 with a 3.60 ERA in his two seasons with the Brewers. I wouldn’t mind taking him back as a solid #3 starter. > The Reds, Indians, and D-backs pulled a blockbuster three-team trade yesterday. Arizona is receiving Didi Gregorious, Tony Sipp, and Lars Anderson, while the Indians are getting Trevor Bauer (wow), Matt Albers, Bryan Shaw, and Drew Stubbs. But the biggest part of this trade was the Reds’ acquisition of Shin-Soo Choo, who will play center field for them. If it wasn’t already clear before, the Reds, who also received Jason Donald in the deal, are going to once again contend in 2013. > The Pirates re-signed Jason Grilli to a two-year deal, meaning he’s officially off the market. Tigers: Signed Brayan Pena to a one-year deal; designated Matt Hoffman for assignment. Twins: Signed Kevin Correia to a two-year deal. Royals: Signed Willy Taveras, George Sherrill, and Dan Wheeler to minor league deals. Blue Jays: Signed Luis Jimenez, Rich Thompson, Eugenio Velez, and ex-Brewers Claudio Vargas and Juan Perez to minor league deals. Yankees: Signed Kevin Youkilis and Ichiro Suzuki to one-year deals. Red Sox: Signed Jack Hannahan to a two-year deal. Cubs: Claimed Sandy Rosario off waivers from the Red Sox; signed Chang-Yong Lim to a split contract. Rangers: Claimed Eli Whiteside off waivers from the Yankees. Dodgers: Acquired Skip Schumaker from the Cardinals; designated Scott Van Slyke for assignment. Cardinals: Acquired Jake Lemmerman from the Dodgers.